In fine weather but windy conditions, there was only one 3 winner: the team of Garth Partridge and Con Kater. 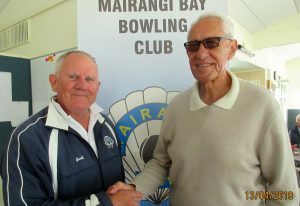 In second place with 2 wins and 13 ends was the team of Geoff Ladd and Bob Mullen. They just beat Matt Stratton and John Smith by one end. Next Saturday is in the Easter period but there will be a Haggle if the weather is kind.